Vomiting, diarrhea, a sudden increase in appetite or loss of appetite, weight loss, anemia and worms in feces are some signs of worm infection in your furry pal. When knowing that their pets have been infected with worms, pet owners always struggle to know more about these worms, why they infect their pets, what precautions they should follow and how to treat and prevent these worms. Considering this most common dilemma of numerous pet parents, we have come up here with a series of questionnaires on worms and their treatments. How my dog does get worms? Dogs and cats get easily infected with worms especially the younger ones – puppies and kitties are highly susceptible. And the most common worms that infect your dog are roundworm and hookworm. It is not so distinctive to find puppies of only 2-3 weeks of age to be harboring a huge number of worms. This phenomenon usually occurs because these internal parasites are passed from a mother to her puppies before birth. And, at times, they are passed through milk shortly after birth. Apart from the roundworms and hookworms, what are the other worms my dog can be infected with? 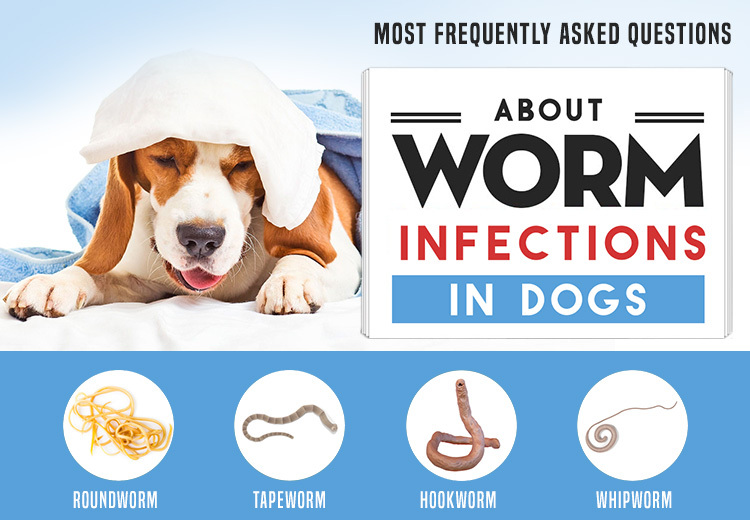 Tapeworms and whipworms are the other worms that your dog is vulnerable to. Additionally, heartworm is also the most common worm that your dog may get infected with if concrete preventative measures are not taken. Deworming with effective worm control program is essential to counter the worm infections in your dog. How will I know that my dog has tapeworms? Among the various worm infections, tapeworms are quite easy to spot. They appear as little pieces of rice. You can see them scattered over your dog’s feces, or stuck around the groin area of your dog. Hydatid tapeworm is quite separate from the common flea tapeworm segments which can be seen in your dog’s feces. These worms are quite fatal and can be a risk for the health of your dog. Roundworms are parasites that reside in your dog’s intestine and feed off an animal’s intestine. With the spaghetti-like appearance, roundworms are normally white or light brown in color with a few inches long lengths. How can I know if my dog has roundworms? Coming across the following symptoms, you can know that your dog is infected with roundworms. With hook-like mouthparts which attaches itself to the wall of the gut, hookworm is the most harmful worm. It is quite fatal to dogs as it punctures the blood vessels and feeds on the blood. This condition usually results in severe anemia. If my dog gets infected with hookworms, what are the symptoms he may suffer from? Can hookworm be transmitted from my dog to my family? A few species of dog hookworms a can easily infect humans by penetrating the skin. These hookworms develop and thrive in the human intestine where they may cause disease. What prevention measures should I take to control worms in dogs? As the most popular saying goes – Prevention is better than Cure. It is always good to de-worm your furry pal regularly. Treat your dog with monthly heartworm preventatives to control heartworm infections. Monthly heartworm medications like Heartgard Plus, Nexgard Spectra, and Revolution are highly effective and acts as a potent shield against diseases due to worms in your furry friend. As tapeworms are easy to find in feces, you can start treatment with tapeworm medications such as popantel tapeworm tablets as soon as these worms appear. Hydatid infection is highly dangerous and can be potentially fatal to your dog, if left untreated. To prevent this tapeworm infection, you need to treat your dog every 6 weeks with a product containing Praziquantel such as cazitel or endogard palatable tapewormer. For roundworm infection, treat every three months. Moreover, as roundworms are most common in puppies, it is compulsory to treat pups when they are 2-3 weeks old just to be safe. Then continue treatment at an interval of 4, 8 and 12 weeks old, and then every 3 months. Similar to roundworms, hookworms are also treated. Puppies are treated at 2, 4, 8 and 12 weeks of age. Then it is treated monthly for six months of age. And, this is followed by regular treatment every 3 months. If you still have questions related to worms in your dog or cat, please do share with us. Our panel of vets would be happy to assist you.